Interactions between a patchy degraded Zostera noltei seagrass meadow and waves, currents, and sedimentary processes were analyzed from data obtained from a strongly wind-influenced micro-tidal brackish water lagoon in southeastern France. Measurements were conducted on offshore and foreshore morphology (topography, bathymetry), on hydrodynamics (waves, water levels, and currents) under different wind conditions within and outside the meadow, and on meadow biometry (shoot density, leaf length). The main impact of this patchy meadow on wind-wave transformations seems to be attenuation of waves further offshore than in the absence of vegetation. This attenuation is particularly notable above the meadow front edge, and is related to wave heights, water levels, and wave periods that are, in turn, dependent on wind intensity and fetch length. The data show that the patchy meadow does not attenuate small and short waves, especially when water levels are high, but is capable, like salt marshes and artificial seagrass, of attenuating relatively high and long waves. Notwithstanding its patchy and degraded character, the meadow also strongly influences the vertical distribution of currents. Whereas currents are strong and significantly influenced by wind and wind waves above the meadow, both waves and currents are dissipated in a transitional canopy-water layer. These wave and current modifications are reflected in the evolution of the seabed. Erosion and sedimentation are mainly controlled by the hydrodynamics but the seasonal state of the meadow plays a role by modulating the hydrodynamics. These substrate changes are, important, in turn, in influencing protection of the shoreline. The online version of this article ( https://doi.org/10.1007/s12237-018-00487-w) contains supplementary material, which is available to authorized users. We thank the reviewers and the Associate Editor for their constructive comments and suggestions which have been helpful in improving the manuscript. GIPREB staff (Guillaume Bernard, Nicolas Mayot, Florian Dandine, Vincent Faure) are thanked for the meadow mapping, field assistance, and tide data. Météo France provided the wind data. GLADYS, the French coastal research group, provided some of the instruments deployed in the course of the study. Members of GLADYS (especially Damien Sous), Doriane Delanghe and Thomas Stieglitz, are thanked for the useful discussions. A.E. Paquier was provided PhD funding by the “Provence Alpes Côte d’Azur” Region, the European Union, GIPREB (Gestion intégrée, prospective, restauration Etang de Berre), and support from OSU-Institut Pythéas. Cavallaro, L., C.L. Re, G. Paratore, A. Viviano, and E. Foti. 2011. Response of Posidonia oceanica to wave motion in shallow-waters. Preliminary experimental results. 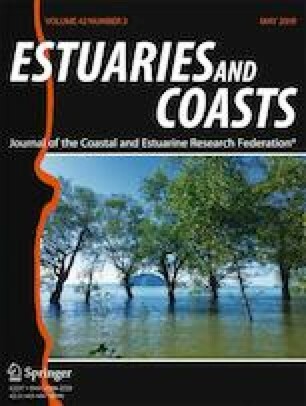 Coastal Engineering Proceedings 1 (32): 49. https://doi.org/10.9753/icce.v32.waves.49. Christianen, M. J. A., J. van Belzen, P. M. J. Herman, M. M. van Katwijk, L. P. M. Lamers, P. J. M. van Leent, and T. J. Bouma. 2013. Low-canopy seagrass beds still provide important coastal protection services. PLoS One 8. https://doi.org/10.1371/journal.pone.0062413. Ganthy, F., A. Sottolichio, and R. Verney. 2011b. Seasonal modification of tidal flat sediment dynamics by seagrass meadows of Zostera noltii (Bassin d’Arcachon, France). Journal of Marine Systems. https://doi.org/10.1016/j.jmarsys.2011.11.027. Lowe, R. J., J. L. Falter, J. R. Koseff, S. G. Monismith, and M. J. Atkinson. 2007. Spectral wave flow attenuation within submerged canopies: Implications for wave energy dissipation. Journal of Geophysical Research, Oceans 112. https://doi.org/10.1029/2006JC003605. Paul, M., and C. L. Amos. 2011. Spatial and seasonal variation in wave attenuation over Zostera noltii. Journal of Geophysical Research, Oceans 116. https://doi.org/10.1029/2010JC006797.